Arrowhead Alpines Blog: Back by popular demand: Drawings! Excellent. 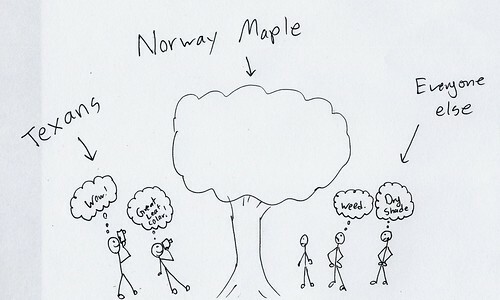 You have perfectly captured the "Norway Maple" experience in Buffalo. Dang tree weed. Joseph, That's a cute and true drawing!When I was in Seattle, I kept admiring the chocolate euphorbias everywhere, but was told they're thuggish. Still, couldn't you make one hardy to zone 5? :) The first rule of blogging:just do what Carol says! Joseph, Anytime you want to draw a cartoon about the Bradford pears in my neighborhood~please do! They are the Norway maple of the Middle South! Hehe. The foliage is darker in the other zone's gardens. my neighbor, Mr Chemicalsrus, has threatened my life if I don't get rid of the sunny yellow dandelions. Go Figure. I love the cartoon and I get it. Funny! Ha! That was me eyeing those Norway maples with interest because we have nothing like that in central Texas. I didn't actually rave about them though. I thought one might be nice in front of a contrasting bright-green foliage. But a whole street of the dark-leaved trees was kind of Addams Family-esque. Love the cartoon! I have no idea what would strike your fancy in Austin, but it's fair to guess that it would be something completely ordinary to my eyes. Remember those New Zealand bloggers I told you about, who went ga-ga taking pictures of squirrels when they were here? They don't have squirrels in N.Z., they sheepishly explained. That is a good one! Yeah, listen to Carol. Is that Vernonia in the garden yet? Gail bought one also. Love it! They could be standing in front of my house. Carol thinks purslane is a weed. Down here in Texas we buy it at the nursery and plant it both for its flowers and to eat. LOL! You drew me perfectlly (I'm the one thinking "Dry shade"). I have one of these in my front yard. It's got a bad trunk, but I haven't taken it down yet, as I was waiting for it to die. It stubbornly refuses. Eliz - yes, that was in front of your house. Or just down the street, I can't remember. I do remember us southerners wondering what the heck they were. So funny. Good one Joseph. I'm with you on euphorbia... I'll add it to my list to work on someday! Yeck -- Bradford pears. Aside from everything else, the flowers STINK. Great meeting you as well! I love blue grasses, so I bet I would rave over your weed. I know you didn't actually RAVE about them... I did take a little creative license :). I love the squirrel story. My sister-in-law is Taiwanese, and every time they visit the States, she wants to see opossums! I haven't planted the vernonia yet -- probably this weekend! It will be interesting to see how it performs! Elizabeth, Jean already said this, but yes, we were just a few houses down from your house. I think purslane is a weed too -- but I also do enjoy eating it in the kitchen. But it is so prolific, there is never any need to plant it. That is one of the worst things about them -- they go on getting mildew and tar spots and generally looking sickly, but refusing to actually die! Go ahead and take it down. You'll feel better! LOL, it's funny how people all across the region view things. Like purslane is that darn weed that grows like crazy in the garden, but everyone tells me it's edible. No thanks.